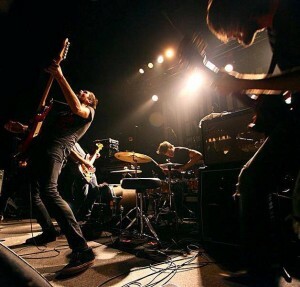 In May of this year, ambient rock band Caspian hosted 5 separate ‘listening parties’ for a select number of fans, in their home town of Beverly, Massachusetts, as well as in London, Berlin, Paris and Porto. The idea was to give some of their biggest supporters the opportunity to listen to their fourth album, Dust and Disquiet, four months before its general release. In addition, the band were looking for the listener to wander from the meeting point, find the right listening environment for them – whether it be surrounded by people or trees – and allow the listening experience to be singular, complete and without interference. The parties were described as being very personal, beautiful, life-affirming events. Having spent the last two years of their lives straining every last drop of creative energy into the album, and during that time suffering the sudden and tragic passing of founding bassist Chris Friedrich, it is entirely understandable why Caspian would want the first listeners of the record to be hand-picked by them, and to even attempt to influence the way they listened to it. Broadly speaking, in the run-up to and eventual release of a new album, the artist’s work first gets arbitrarily dissected and analysed by the media, and then thrown to the masses for general consumption. As I would sit a dear friend down, hand them a pair of decent headphones, and ask them to listen to a meaningful or loved piece of music, so that they might experience what I experience, so Caspian did much the same thing with their own record, and on a much bigger scale. As the tidal wave of digital media continues to pour continuously into my eyes and my ears, my ability to spend time with an album, get to know it, maybe even have a loving relationship with it, is so much less than it was, and I am fairly sure I’m not alone. I might get all misty-eyed about cellophane wrapping, inlay cards and secret messages on vinyl run-ins, but I am ashamed to admit that I have spent far too much of the last ten years on Shuffle (or Tinder for the MP3, if you will). Well, I am delighted to say, all of that has just stopped, and it is thanks to Caspian. Dust and Disquiet is an astounding, monumental record. I have listened to it, from start to finish, at least twenty times already, and on each listen I love it more. Lazily and restrictively categorised as ‘instrumental post-rock’, 2012’s Waking Season saw a perhaps deliberate attempt by Caspian to begin to distance themselves from the genre’s hackneyed formulas, with the album’s title track ending so abruptly (and with no sonic eruption) after an enormous build that some first-time listeners thought there was fault with their copy of the record. It was, in fact, a comment from the band about what was to come – a lush, textured collection that retained much of the heft of earlier output, but with greater ambient experimentation, and in ‘Gone In Bloom and Bough’ a first foray into vocals, albeit a heavily vocodered yet tremendously effective turn from Jamieson. Dust and Disquiet represents Caspian finally in full bloom, full flight, arching their backs and spreading their wings into unchartered, widescreen territory, and yet brilliantly retaining that unmistakeable, intoxicating depth and power to their music. The unexpectedly orchestral but utterly sumptuous introductory piece ‘Separation No.2’ opens the album with elegiac guitar tones, sweeping strings and deliciously understated brass accompaniment, but just as you think that shiver down your spine is going to get a shiver of its own, it is gone. Whether it is called so because it ends too soon, like the opening track from the previous album, is a guess. However, if ‘Separation No.2’ is the delectable hors d’œuvre, then ‘Ríoseco’ is a heavenly starter, as it twinkles and glides into gear, the multiple guitar lines intertwining wonderfully with mournful strings and Joe Vickers’ superbly dynamic percussion. Just as you think things are going to accelerate into one almighty Caspian ascension, a slide guitar arrives and drops everything back down again. It is one of many unforeseen masterstrokes. Eventually, fantastically, the track breaks into an electrifying, head-spinning climax, as commanding and equally beautiful as anything the band have previously committed to record. ‘Arcs of Command’ is similarly stupendous. Beginning with an urgent, electronic riff, which miraculously manages to remain audible for a large part of the ensuing maelstrom, initially distant, complex percussion emerges, while layer upon layer of effects laden guitar join the fray, leading to the moment when Vickers turns on the power and the band surges into that enormously powerful and simply breathtaking sonic landscape, where they can somehow sound entirely elegant and flat-out ferocious at the same time. What is most remarkable about the track is the fact that it is unrelenting. Just as you think it has peaked, another decimating, all-encompassing passage of unbridled enormity arrives and just blows you away, again and again. ‘Echo and Abyss’ begins with a very similar electronic pulse to ‘Arcs of Command’ but takes a different path. The luxurious, gothic guitars of the opening are quickly overtaken by a much heavier, punchier strain which is certainly the most metallic I have heard Caspian deliver, accentuated by a semi-growled, processed vocal. After such a full-blooded beginning, the band chose the becalmed, acoustic ‘Run Dry’ as the centrepiece of the album, to provide respite and showcase another facet of their expanding style. With a superbly languid and disconsolate vocal courtesy of guitarist Cal Joss, it represents a massive departure for the band, and yet is delivered so gracefully, so evocatively, that I immediately want to hear more of this version of the band. The poignant “We’re wide awake now” refrain presumably a reference to the previous album, and all that the band has been through together. In much the same way as the opening two tracks of the album seem deliberately connected, so the closing two are, with ‘Aeternum Vale’’s two minute, single, American country guitar licks juxtaposing with the album’s titular closer. Dedicated to Chris Friedrich, ‘Dust and Disquiet’ begins with far-away voices and soft electric keys, on a bed of warm, fuzzing bass and lone, plucked guitar. The keys are gradually played more harshly as the band build to the moment when Vickers again displays why he plays such a vital role in the vigorous, progressive rock of Caspian, carrying the track to what would have been an almighty conclusion in its own right, as guitars rage and bleed all around him. However, what follows is six-and-a-half minutes of the most beautiful music you are likely to hear all year, and a fitting tribute to their dear departed friend. Not heard since the opening track, the horns make a welcome and spectacular return, and combine in stunning union with a building cacophony of blazing, resonating guitars. If this doesn’t replace ‘Hoppípolla’ as television’s go-to piece for mating scenes in wildlife documentaries and sporting montages,  then the world simply doesn’t have ears. 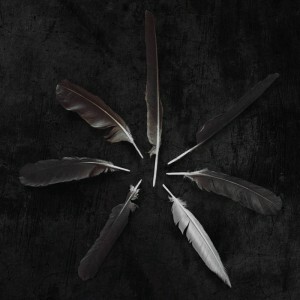 I have one thing left to say: buy Caspian’s album Dust and Disquiet. Buy it, don’t download it. Buy a physical copy of it, as I have, and, when it arrives, book a time and a place to listen to it, to really listen. In it you will hear songs – often without words – saying a thousand things about heartbreak and pain, devastation and loss. And yet, amongst all that dust and disquiet, there is an abundance of solace and hope. In community, in shared experience, in live performance, Caspian are indeed wide awake now, and the memory of Chris Friedrich will forever live on in their most astonishing music.